Clinton Webster Whitehead was born 8 February 1923 in Lawrenceville, Gwinnett County, Georgia to John M. and Alma Whitehead. By about the age of 7 years, Clinton was living in Atlanta with his parents and siblings. Ten years later in 1940, the family was still in Atlanta. Clinton's father was a laborer for the Works Progress Administration Park Project. At the age of 19, about six months after the bombing of Pearl Harbor, Clinton registered for the draft. Another six or seven months passed before Clinton officially enlisted in the United States Army on 7 January 1943 -- a month before his 20th birthday. Ten more months would pass. Then, just after Thanksgiving 1943, Clinton would be lost at sea. 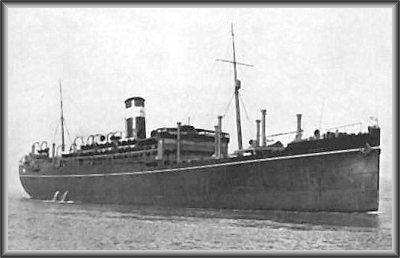 [As the sun set on 26 November 1943] a remote-controlled glider bomb slammed into the HMT Rohna, a British transport with mostly Americans onboard, and blew gaping holes in both the port and starboard sides. Despite the presence of nearby rescue boats, 1,149 men went down with the Rohna, an incident the U.S. government largely kept secret for decades. An estimated 300 men died in the blast…Within an hour or so, the Rohna disappeared below the surface, and all those who hadn’t yet jumped into the water were forced to do so. Many were sucked under the ship never to reappear; others found themselves covered in leaking oil. The cold, darkness, big swells and strong currents also took their toll, as did German strafing fire. A memorial to those lives lost with the sinking of the Rohna was dedicated in 1996 at Fort Mitchell National Cemetery in Seale, Alabama by The Rohna Survivors Memorial Association. This association also maintains a casualties list by name, rank, serial number, and unit. Clinton's unit was the 853rd Engineer Battalion, Aviation Corps of Engineers. Clinton's mother Alma died in 1962. His father died in 1969. They rest at Hopewell Church Cemetery back in Gwinnett County, Georgia, where there also sits a cenotaph dedicated to their son (pictured at top). Given the noted secrecy that surrounded this catastrophe for years, I wonder if Clinton's parents ever knew what truly befell him in 1943. Thank you for sharing this history. What a loss! I hope you are well, my dear. Thanks for stopping by, Darla. Hope your garden is still thriving.